Several years ago, Annette and her husband owned a business together in the Northeastern part of the United States before moving to Alabama. When Annette's husband was diagnosed with cancer, their lives and business had to be put on hold. No one plans to become seriously ill and have to sell your business and ultimately lose your home, but it happens more often than most people realize. During this time Annette was forced to put her dental needs on the back burner. This resulted in an overwhelming situation that became more involved the longer she delayed. Ultimately she didn't see any chance to restore her smile to the point that she could restore her confidence. We were touched when she told us that she didn't know if she knew how to smile anymore. After losing her home, her business, and her husband to cancer, she decided it was time to have her teeth fixed. 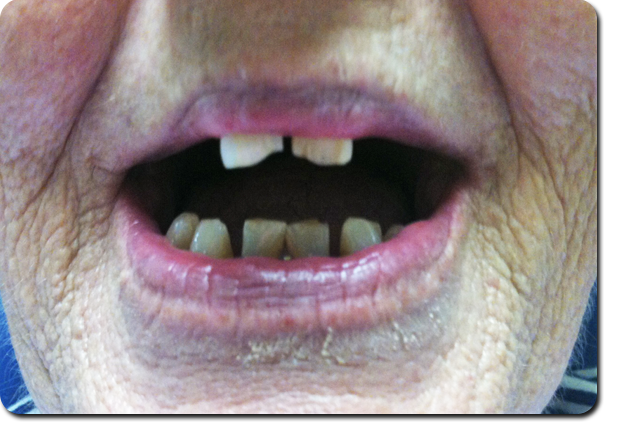 She visited several local dental offices, where she received estimates from $3,000 to $5,000 to rebuild her smile. She began to save and over two years she accumulated $500 towards her smile restoration. We were inspired by Annette's story and decided to help. What you see in our first Smile Story Feature is Annette's before and after pictures and we are happy to say that she no longer has to try not to smile! We have made a friend along the way and her story has made a difference in all of our lives.